Ronald J. Fields won the Emmy Award in 1986 for the PBS documentary W.C. Fields Straight Up. Emmy Award 1986, W.C. Fields Straight Up for Outstanding Informational Special documentary. Left, Ronald J. Fields, W.C. Fields Productions, Inc., and right, Robert B. Weide, Whyaduck Productions, producers. 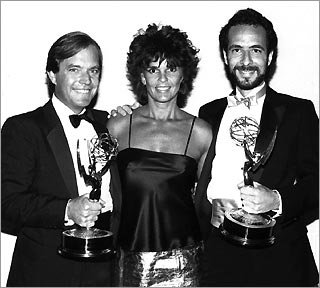 Emmy presented by Ali McGraw, center. © W.C. Fields Straight Up, Ronald J. Fields, W.C. Fields Productions, Inc., Whyaduck Productions.